In another post the periodic table was listed as a hobby which jogged an old memory. This is poor graphic of Timothy Stowe's version based on atomic numbers. More versions of the periodic table can be found here and here. Different ways to view it depending upon you work or the way your mind works. There's an app for that! ") For the iPod Touch, I mean. I've got it on mine and it's free. It's called The Chemical Touch and it's a great free app! Update! This quipped my interest so I took a look and there is now a version for a buck and the free version. Downloaded the paid version and it is very nice! Definitely worth 99 pennies! Thank you for the first link, Ron. I have never seen that page before. Many years ago, too many in fact, I became interested in the Periodic Table of the Elements. I was in grade school and for some reason I began reading the descriptions of the elements in an encyclopedia. It was a mishmash of data, much regarding so called "pure" elements containing several percent of various other elements. After a few years, by around 1967, I had finally deciphered the underlying formula that calculates the number of elements that a row of the table should have. There was no internet at that time and books of this nature were not accessible to me. Finally in 1968 I saw the same formula and also an explanation as to why it works. After making a few cardboard tables my interest waned and waxed over the passing years. Finally I converted and updated the charts to Microsoft Excel. My table design is unique and I have never seen a similar design. It contains 168 elements with the lanthanide, actinide, and the as yet unnamed "5g electron" filling sub shell series folded and stacked. This layout seems to become alive as I ponder it, much like a musician becomes a part of the music. The data probably needs more tweaking or updating but I don't seem to have the time. Some of the data is or may be in conflicting units since the scientific community has adopted different conventions over the years to become the new measurement standard. Here in the United States temperature was mainly displayed in degrees Fahrenheit and occasionally in degrees Celsius and very very rarely degrees Kelvin which is the scale I used. My table also includes estimates on the physical properties of some very heavy elements. Some parts may be off but in my mind I feel that I am close. There is a certain symmetry that captivates my soul. If anyone would like a copy of the two files, front and rear of the table of course, then please send me a private message with your email address. Shadowalker has a copy but I do not know if he ever printed it out. Tom have you looked at the files? As I am presently having way too many senior moments I would like to get my ideas out on the web but no one seems to be interested in this geeky endeavor. There appears to be no one to discuss this topic with. Ted; you also attach the Excel spread sheet to a post here for folks to look at. I really don't have any skill set left to critique it (at its' nader it was not that good either) but a new way to look at it is always cool. Ron, I was just going to PM you. Could I upload the two files to my photo gallery? The largest is 66 kb. Photo gallery won't accept the format so here goes I hope. "The files you may upload must have the following extension: .gif,.jpg,.txt,.zip,.png,.xls,.ppt,.doc,.rtf,.txt,.htm,.html,.pdf,.len,.zmx,.wav"
Ah, save it in excel as a text file (.txt) then open in word and save as a .doc file. You'll be good to go. Ted, it looks like you could zip them and attach to a post (I'd like a look at them, myself...). Also add a Chart of the Nuclides to the list... this one is one of my favorites. For basic periodic tables, I really like this one. How many of you had to memorize that table while in High School? How's about the multiplication table, the US capitols etc? What do todays students memorize in High School? That rips the chart to shreds. 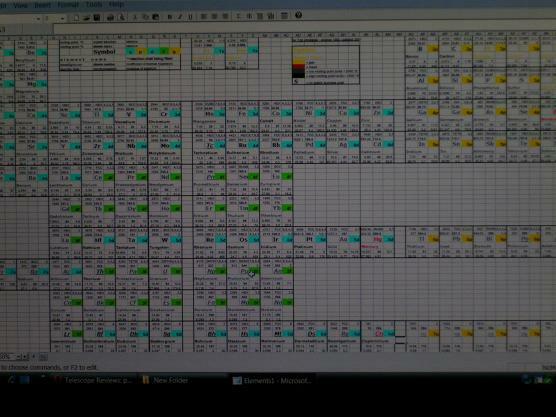 Here is a reduced size screen shot of a portion of the front side of my chart. zip it then. Ya, you have too much fancy formating going on for converting it to text. I tested it on a simple comma delimited file. Edit: Here is the attachment for the front side of the table. The flip side of the chart. Edit: Here is the attachment for the back side of the table. Does Windows have a snow compression utility? 118 elements? I remember when there were 104.
um... er, ah... there's a cool one for the HP-48 and HP-49 and HP-50 series of calculators... can display about half of the table at one time... can calculate molecular weights. And speaking of new, synthetic elements, I wonder how many there are that we don't have yet in planetary nebulae! I'm in the middle of reading this book about the history of the Periodic Table. Sounds like you guys are way advanced, and probably know much of it already- but it's a very interesting read. I asked a related question in the Space Rocks Forum a while back. My question involved heavy element abundances in meteorites. It might be possible that an as of yet undiscovered super heavy isotope left a trace of it's existence. The trace would be spontaneous fission products that are more massive than the ones we are familiar with from our experience with atomic fission of plutonium and uranium. Your exotic super heavy elements are so unstable that if they ever existed in nature at some point they quickly degrade into smaller components. True 'nuff... so much for those "islands of stability". The islands of stability may exist. At the present time we are unable to create heavy element isotopes with a sufficient number of neutrons. The nuclei are all neutron deficient. I'm holding out for element 114 with a mass number 298, element 120 with a mass number of 304 and element 126 with a mass number of 310 to all possess significant half lives. Ah, but to find them wearing a spacesuit, tethered to a warp driven spaceship, and sending the info back to Houston!